World War II revealed, to an extent hitherto unconsidered and in any event unobtainable by the technology of the period, the very clear advantage of being able to carry men, light weapons and many types of equipment and supplies straight from the landing craft, either beached or lying just offshore, across the assault beach to the forward edge of the beach-head – all without exposing them to small-arms fire and mortar bomb fragments. This need spawned a number of types, both armoured and unarmoured, with tracked propulsion, but there also emerged the desire for an amphibious truck optimised for ferry work. Such a type would provide the great advantage of being able to handle stores without the need for transhipment, especially in the later stages of a landing, when the risks of direct fire from enemy positions were significantly lower and the vehicle could therefore be unarmoured. The result was the DUKW, generally known as the ‘Duck’, which was an amphibious modification of the 2-ton General Motors CCKW truck used by the US forces. Designed by the naval architecture firm Sparkman & Stephens in partnership with General Motors, the DUKW was used for the movement of men and cargo over land and water and, while providing an unrivalled capability in approaching and crossing beaches during amphibious assaults, it was not created for longevity but rather for hostilities-only service. The name of the vehicle came from General Motors’ vehicle designation system, in which D indicated the 1942 design year, U the vehicle’s utility nature, K the use of all-wheel drive and W the use of twin rear axles. The vehicle was designed by Rod Stephens of Sparkman & Stephens, Dennis Puleston, a British deep-water yachtsman living in the USA, and Frank W. Speir, a lieutenant of the Reserve Officers’ Training Corps and graduate of the Massachusetts Institute of Technology. Developed by the National Defense Research Committee and the Office of Scientific Research and Development to provide the capability to resupply units which had just come ashore in an amphibious assault, the resulting type was at first rejected by the armed forces. However, after a US Coast Guard patrol vessel had run aground on a sandbar near Provincetown, Massachusetts, an experimental DUKW happened to be in the area for a demonstration, and was able to rescue the seven men of the patrol vessel’s crew in conditions (60-kt wind, rain and heavy surf) which had prevented conventional craft from achieving the rescue. After this practical validation, military opposition to the DUKW swiftly faded, and further trials confirmed the DUKW’s seaworthiness even on comparatively long passages. The basis of the DUKW prototype was the AFKWX, a cab-over-engine variant of the CCKW military truck with six-wheel drive. To this basic chassis and propulsion arrangement were added a watertight hull and, in a semi-tunnel under the rear, a propeller and rudder for waterborne propulsion and steering. The final design approved for production in October 1942, after exhaustive trials by the Engineer Special Brigades at Cape Cod, was perfected by a small engineering team of the Yellow Truck & Coach company of Pontiac, Michigan, and the vehicle was built by the GMC division of General Motors, which was still called Yellow Truck and Coach at the beginning of the war. On land, the topsides of the DUKW were almost 6 ft (1.83 m) above the roadway, but at sea, the freeboard of the laden DUKW could be as little as 1 ft 6 in (0.46 m). These were both deemed drawbacks in the DUKW’s two operating environments, but nonetheless the DUKW was a huge operational success, so the extent that there seemed never to be sufficient DUKW vehicles to satisfy demand despite the production of 21,147 examples by the summer of 1945. The British ordered 2,000 examples of the DUKW in January 1943, and enough had been delivered by July of the same year for the vehicle to make its operational debut in the ‘Husky’ landings on Sicily. Shepherded by a motor launch, 300 of DUKW vehicles proved very successful later in the campaign when they ferried supplies across the Strait of Messina, and in the ‘Avalanche’ landing at Salerno in September 1943 the US Army’s 105-mm (4.13-in) howitzers were brought ashore in DUKW vehicles so that they could be brought into action far more quickly than would have been the case had they been transhipped from landing craft. The naval commander felt the vehicles’ full value could not be exploited at Salerno to maximum effect because they had been diverted to US Army rather than US Navy service at so early a stage, however, and thinking of this type may have delayed the DUKW’s use in the US Navy-led commands of the Pacific theatre. The DUKW did not come into full service in this theatre before February 1944, when 60 of the vehicles were first used to land army howitzers and another 40 to land supplies. In this ‘Flintlock’ operation at Roi and Namur in the Marshall islands group, the DUKW vehicles were carried on the vehicle (upper) decks tank landing ships and driven down the interior ramp to the tank (lower) deck for launching over the bow ramp while the tank landing ships were still offshore. The DUKW vehicles landed their cargoes of guns, hoisting these out with A-frames and lifting tackles fitted to some vehicles which backed against others for unloading. These then returned for stores (two cargo nets or preloaded pallets per vehicle) to be delivered in bulk from the tank landing ships. 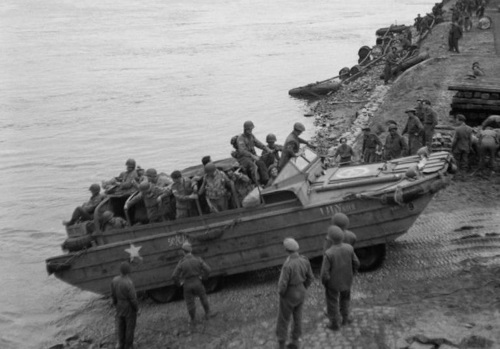 On other occasions, DUKW vehicles yoked in pairs by a removable platform were used to carry light vehicles ashore. The cargo area, which could be covered by bows and a canvas tilt, measured 12 ft 6 in (3.81 m) in length and 6 ft 9.75 in (2.08 m) in width. The marshalling of DUKW groups, which was undertaken in the British forces by the Royal Army Service Corps using motor boats and in the US forces by LCVPs (Landing Craft, Vehicle Personnel), was difficult in rough weather – when many of these unwieldy craft foundered. 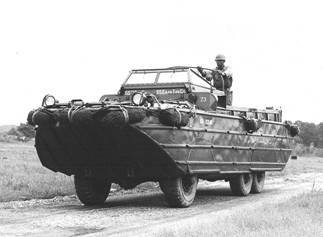 Once ashore its large wheels allowed the DUKW to negotiate rough terrain. Like many other vehicles, however, the DUKW required bulldozer aid in the volcanic sand of Iwo Jima in the ‘Detachment’ of February 1945. 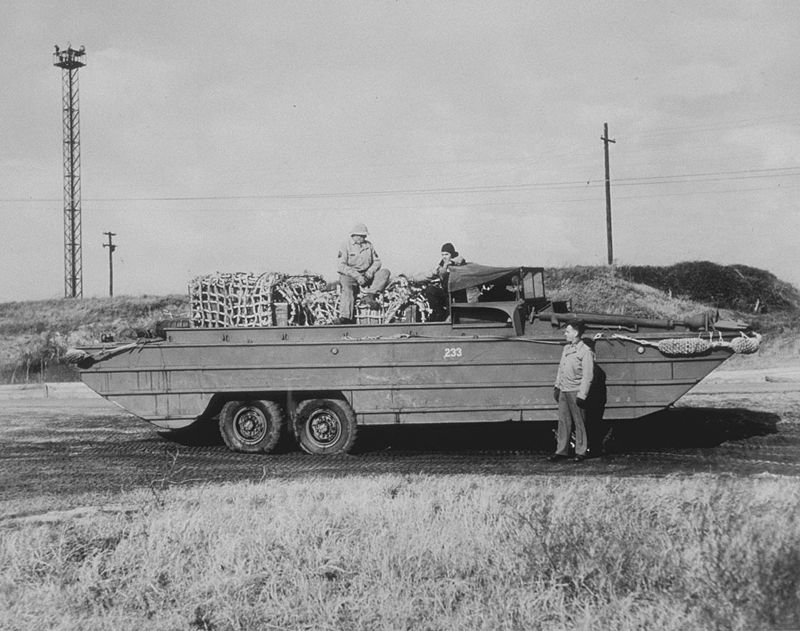 The DUKW was not designed as a fighting vehicle, but a pair of the first DUKW trucks in the Pacific theatre were adapted by US Army engineers to carry 120 4-in (102-mm) rockets with a range of 1,100 yards (1005 m). These were then fired to cover troops as their assault craft carried them to within a distance of 150 yards (140 m) of the beaches at Arawe on New Britain island during the ‘Director’ landing of December 1943. DUKW companies of the British army, US Army and US Marine Corps were involved in all the major Allied landings after 1943, and also in a host of river crossings. The DUKW was complicated to maintain, and the two US Army and one US Marine Corps DUKW companies in ‘Detachment’ had to have 200 spare shafts and propellers urgently flown from Hawaii before that operation. Although some DUKW vehicles were carried in the davits of transport vessels in the course of a few operations, it was the close link between tank landing ships and all Allied amphibious vehicles which made possible the vehicles’ use in great numbers. The DUKW was powered by a 269-cu in (4408 cm³) General Motors water-cooled six-cylinder inline engine delivering 94 hp (70 kW). The vehicle weighed 6.5 tons 13,000 lb (5895 kg) empty and 18,600 lb (8435 kg) loaded, and its performance included a speed of 50 mph (80 km/h) on roads and 5.5 kt on water, and a range of 400 miles (645 km) on roads at 35 mph (56 km/h) and 50 nm on water. The vehicle was 31 ft (9.45 m) long, 8 ft 2.875 in (2.51 m) wide, 7 ft 1.375 in (2.17 m) high with the folding canvas top down and 8 ft 9.5 in (2.68 m) with the folding canvas top up. A ring mount was fitted on all DUKW vehicles during manufacture, but only about 25% of the vehicles were equipped with a 0.5-in (12.7-mm) Browning heavy machine gun. Operated by a one- or two-man crew, the DUKW could carry 25 troops, or 12 litters, or 5,000 lb (2268 kg) of cargo. The DUKW was not created as an armoured vehicle, being plated with steel sheet between 1/16 and 1/8 in (1.59 and 3.175 mm) thick to keep the weight to a minimum and thereby maximize buoyancy. A high-capacity bilge pump system kept the vehicle from sinking if the thin hull was breached by holes up to 2 ins (51 mm) in diameter. The DUKW was the first vehicle to provide the driver with the capability to vary the tyre pressure from inside the cab with the use of a device created by Speir: the tyres were fully inflated to run on hard surfaces such as roads, and were less inflated to run on softer surfaces, especially beach sand. This added to the DUKW’s great versatility as an amphibious vehicle. Of the 21,147 DUKW vehicles to emerge from the production line, 2,000 were supplied to the UK, 535 to Australia, and 586 to the USSR, which built its own version as the BAV-485 after World War II.